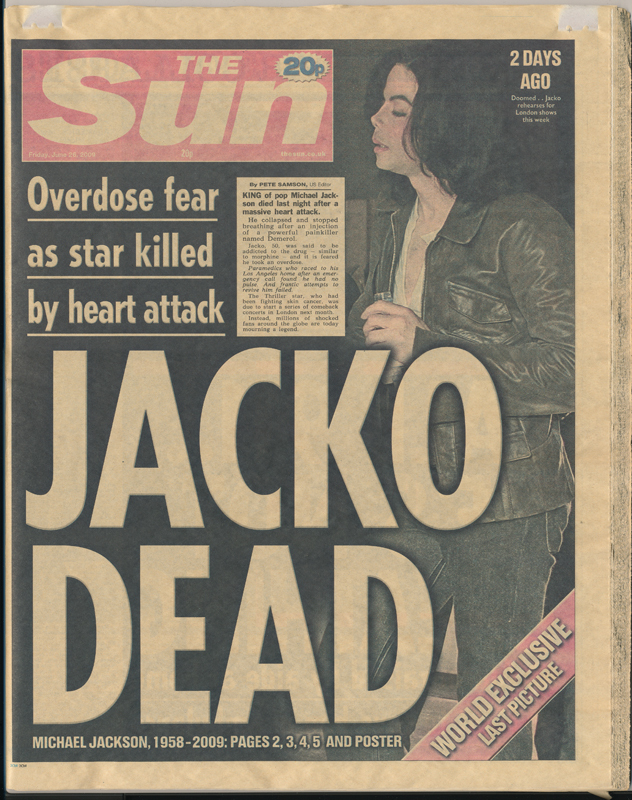 Michael Jackson Was Dead is a one-day exhibition featuring two copies of The Sun newspaper printed the day after Michael Jackson’s death in 2009. One copy has been kept in complete darkness for exactly twelve months, the other has been hanging in the window of Rachel Tweddell’s sunny south-facing studio all year. On Friday June 25th 2010 the two copies, by now physically very different, will both be exposed to daylight for the first time, offering a visible representation of the passing of a year, and remembering a life entirely defined by media exposure. When news of Jackson’s death first started to spread on June 25th 2009, Google momentarily thought it was under attack because of the millions of people all searching for Michael Jackson at the same time. Twitter and Wikipedia both crashed, and AOL instant messenger collapsed for forty minutes. Web traffic was 20% higher than ever recorded, and Michael Jackson was the topic of every front page headline in The Sun for two weeks. This piece of work is a presentation of dramatic breaking news one year after the news has broken, using the slow, gradual process of fading in daylight. The newspaper that has been exposed to the light is brittle and almost monochrome, Jackson’s face bleached to the colour of the paper; the copy that has been kept in darkness seems brand new. Both papers are reporting the same news; they look and feel different yet they are essentially the same. The work is a concise display of contradictions - fame and privacy, shock and memory, permanence and transience, sameness and difference. It considers the conflict inherent in thinking about a sudden event as it fades into distant memory, and how an event can alter its nature and its import without changing in itself. One year on the news is still the same. Michael Jackson is still dead. Michael Jackson will always be dead. Michael Jackson Was Dead will be on show for one day only. See below for all twelve copies of the newspaper, hung in the sunny window at monthly intervals. Only the first and last newspaper were used in the final piece.